Two men living in Phoenix, including one whom the F.B.I. 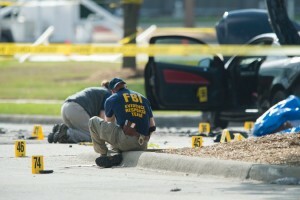 had linked to Islamist terrorism, were identified Monday by law enforcement officials as the pair who opened fire, and then were killed by a police officer, at an event in Texas where people were invited to present cartoons of the Prophet Muhammad. One of the men identified as a gunman, Elton Simpson, 30, was convicted in 2011 of lying to F.B.I. agents — denying that he had made plans to travel to Somalia, when in fact, he had. Prosecutors charged that he wanted to go “for the purpose of engaging in violent jihad,” but a judge ruled that the government had not proved that part of the charge, and sentenced him to three years’ probation.